A backfill entry for my fantastic fortnight in Iran on Wild Frontiers‘s Land of the Peacock Throne recce tour in 2007. 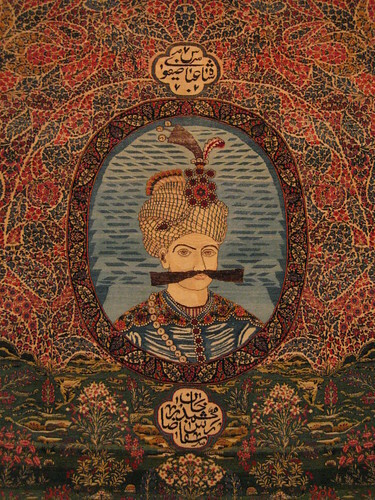 Almost a decade ago now, most of the detail comes from the photos in my Iran – Land of the Peacock Throne, April/May 2007 Flickr album plus my very brief write up from July 2007. Surprisingly easy immigration (ie nothing more than a passport / visa check), and the group minibus to the Laleh hotel, via the Azadi Tower (برج آزادی‎, Borj e Āzādi). Time for a wash and brush up, and a few photos out of my 11th floor window: the infamous Tehran traffic, north Tehran including the telecom tower (Milad Tower, Borj e Milād, برج میلاد ) and the Alborz (البرز‎) mountains, topped with snow. Our morning started with a tour of the National Museum of Iran (Mūze-ye Millī-ye Irān, موزهٔ ملی ایران‎) where we saw a copy of the Laws of Hammurabi stele and well explained replica bas reliefs from Persepolis. A drive past the US Embassy brought us to the Treasury of National Jewels, home to an astounding array of jewels and gems and the eponymous Peacock Throne – all accessed via a metal detector, no bags allowed. The highlight of the afternoon was personal favourite – the National Carpet Museum, conveniently close to the hotel. We dined at the Laleh’s top floor panoramic restaurant, with a stunning electrical storm for ‘entertainment’ as Stan and Mehran talked us through the itinerary for the coming few days. A slow drive out of Tehran thanks to the infamous traffic, stopping off at a roadside fruit stall just before joining the motorway to Hamadan aka ancient Ecbatana. As we headed west, the sun gave way to grey clouds and it got rather cold – a reviving tea stop was soon followed by the sight of snow on the surrounding hills. The afternoon’s highlight was a visit to the super kitsch Ali Sadr Cave (غار علی صدر), where we embarked on a pedalo powered boat train for a tour of the caves. Then it was back onto the coach for the drive to Hamadan, where we were welcomed with hailstones the size of Mint Imperials. Not quite the weather I’d anticipated. Our base in Hamadan was the Baba Taher hotel, which was also the main venue for the 21st International Festival of Films for Children and Young Adults, which made for lots of TV crews, personalities and questions as to what we thought of the festival. A bit tricky to answer, seeing as we knew nothing about it, or the films on show. Still, we were the centre of attention and Stan lucked out more than once on the interview stakes. Our hotel dinner was accompanied by our first taste of Delster non alcoholic malt beverage – this would be as close as we got to beer in Iran. A full day in, kicking off with a visit to the site of ancient Ecbatana before heading back into downtown Hamadān and to the 12th century Gonbad-e ‘Alavian mausoleum with its beautiful decorative brickwork, and then on to the tomb of Esther and Mordecai. In between historic sights, we had a fantastic two hours free to explore the 1920’s town centre and its maze of backstreets and bazaars, with the snow-capped Alwand Mountains (الوند‎) by way of backdrop. Lots of highlights – from fluorescent-dyed chicks for sale alongside tomatoes and gold in the bazaar to a bakery in full production flow. 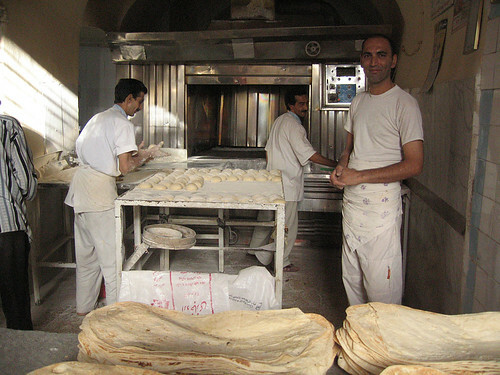 Seeing the teams on the lavash production line never failed to impress. To round off the day we paid a visit to Shir Sangi (شیر سنگی همدان‎) aka (Alexander’s) Stone Lion and Avicenna‘s tomb with its ‘rocket ship meets water tower’ tower before driving out along the old Royal Road (which would ultimately bring you to Babylon) to the rural park at Ganj Nameh (گنجنامه‎) to see the huge inscriptions carved into the rock face at the orders of Darius and Xerxes, and where a young couple shared their bowl of mulberries with me. So friendly. Dinner at the panoramic restaurant, sat on carpets, deconstructing giant kebabs. I enjoyed our time in Hamadān – it felt a little bit off the beaten track compared to most of the other places we visited on the tour, and gave us a chance to see daily life away from the main tourist spots. The day started with a drive across rural Iran to Kashan, sheep and goats grazing under surprisingly blue skies. 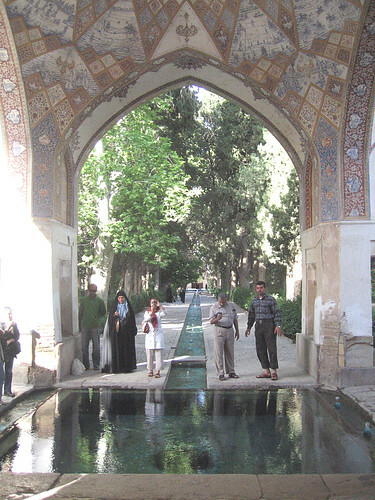 With tranquil paths and water rippling over blue tiles, the Bagh-e Fin (باغ فین‎‎ ) – the Royal Gardens of Fin – on the outskirts of Kashan was the first place that gave me goosebumps in Iran. 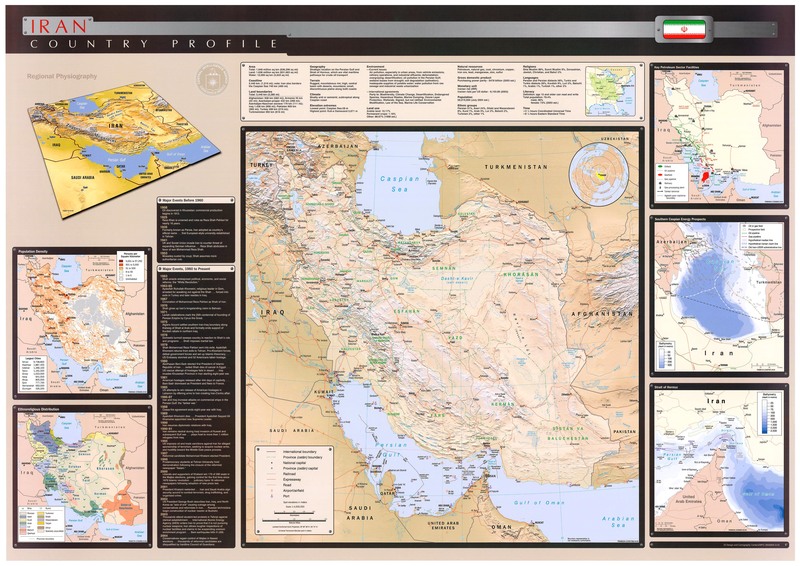 A real sense of Persian history being close enough to touch. We spent the afternoon exploring some sights from Kashan’s mercantile past, starting at the Borujerdi merchant house (خانهٔ بروجردی‌ها‎‎), complete with an open air air-conditioning unit, wall paintings of a European army, and our first sight of wind towers. Nearby, Mehran pointed out the door of another old merchant house, with traditional his ‘n’ hers door knockers. Lady visitors use the lighter, circular door knocker, gents use the heavier, block-like one. That way ladies meet ladies, and gents greet gents, and no one gets embarrassed. A few minutes walk from the Boroujerdi merchant house we came to a yakh-chāl – a traditional ice house – gradually falling into ruin. Ice would be brought down from the nearby mountains and packed in with straw in the subterranean section of the ice house. Our stroll along Alavi Street brought us to another bakery. No matter how often we saw bakers at work, they never lost their charm or fascination. The speed at which they work, each doing their particular past of the process, is stunning. Teamwork in action. And lavash bread, hot off the presses, is delicious! 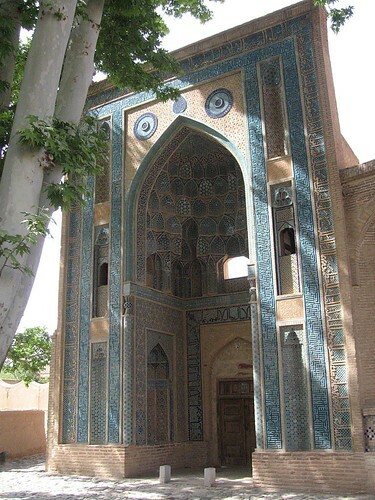 Our base in Kashan, the Amir Kabir hotel, was on the outskirts of town not far from the Fin Gardens. The street behind the hotel was lined with traditional houses, some of which were in better condition than others. Before dinner (I forget where) we walked along alleyways and side streets to a mosque / tomb, which turned out to be closed. Almost ten years later, with the power of Google, and the decoration on the polygonal tiled tower, I’ve worked out that it was the Mausoleum of Imamzadeh Ibrahim, aka Imamzade Shahzade Ibrahim (آستان مبارکه شاهزاده ابراهیم ع). I woke up at 6am, so I thought I’d retrace the route of last night’s after dinner stroll and visit the Mosque/Mausoleum in the daytime. 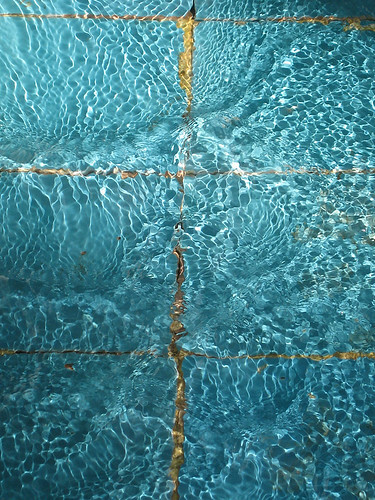 I was allowed in and photographed the pool in the lovely clear morning light. 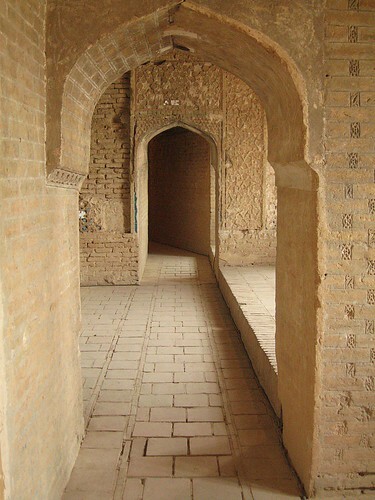 Then a peaceful stroll alone along the rural alleyways back to the Amir Kabir Hotel. The morning drive took us to Na’in (نایین) to visit one of Iran’s oldest still standing mosques, and on to Meybod (ميبد) for lunch in the restaurant of the restored Caravanserai Sultan Abad (Shah Abbasi Caravanserai). Tasty food in a fantastic setting – lolling around on Persian carpets eating kebabs, grilled fish, tongue, or aubergine for we vegetarians. 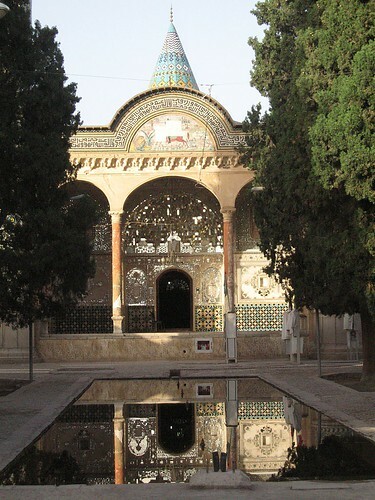 The small squat structure in the middle of the caravanserai courtyard covered a finely finished pool; cool clear water channelled here through qanats from the Zagros mountains. We arrived in Yazd in the early afternoon. 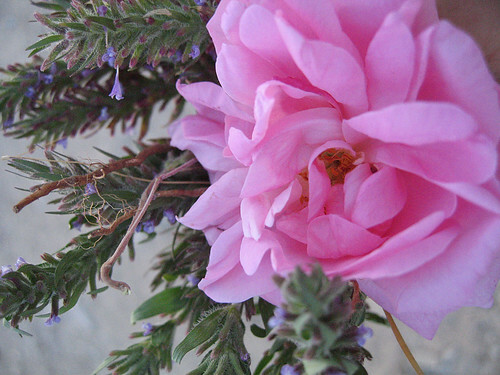 I loved Yazd – from the badgirs and backstreets, to the magnificent Jameh Mosque (مسجد جامع یزد‎‎) …. … to our beautiful hotel – the Moshir-al-Mamalek – a restored town house, built around a classic Persian water garden, which provided a perfect setting for dinner that evening. An afternoon walking tour took us through the backstreets and alleyways of Yazd, to the Tomb of the Twelve Imams / Bogheh-e-Davazdah Emam, “Alexander’s prison”, and restored traditional house, complete with badgir wind catcher. We finished up in Amir Chakhmaq Square (مجموعه میدان امیرچقماق‎‎), we watched sunset from the Tekyeh – superb views out over the wind towers of Yazd to the Zagros mountains beyond. Waking early, I spent a tranquil hour in the Moshir-al-Mamalek’s gardens, reading on one of the raised reclining beds and strolling alongside the water channels. We had an hour or so free time to explore Yazd before heading off on a long day’s drive to Bazm, although sadly our second day in Yazd fell on a Friday so almost everything was shut. After strolling around the deserted bazaar and crumbling backstreets we made our way along Imam Khomeini Street, where we were intrigued by the crystalised sugar shops and met a family from Bandar-e-Abbas who stopped for a chat, and the ladies persuaded Andrea and me to try on their “I’m a married woman” face masks. All aboard our Yutong Health Bus we made one last stop on the outskirts of Yazd before leaving – climbing up to the top of the Zoroastrian Towers of Silence (Dakhmeh-ye Zartosh-tiyun), as local boys on motorbikes zoomed by. A long drive from Yazd to Bazm – through orchards, where we had our picnic lunch, and then across desert plains. Arriving at our Bazm homestay, our host Mr Abbas Barzegar’s daughters presented us with welcome gifts, delighted and delightful in traditional dress. A little later an early evening stroll around Bazm took us to the village mosque, where we sat on the bench around an old tree and talked with some of the villagers there, swopping the Lonely Planet Farsi phrasebook between us. As we left, they gave us flowers. Back at the Barzegar family house, we had a delicious home made dinner after which Mrs Barzegar offered to dressed up in a traditional wedding outfit – how could I refuse? A warm evening, so some of us opted for a night out on the rooftop sleeping under the stars. After breakfast with the Barzegars we left Bazm village and drove into the Bavanat county countryside, walking to a nomad camp for sweet tea and an insight into nomadic life. After admiring their ingenious recycling of drinks packets into mats and bags, we were allowed to try our hand at churning butter in a sheep/goat skin and spinning using a traditional drop spindle. Then on to Pasargadae (پاسارگاد Πασαργάδαι) and the Tomb of Cyrus the Great, before spending the rest of the day exploring magical Persepolis, and Darius I‘s amazing complex of temples and palaces. 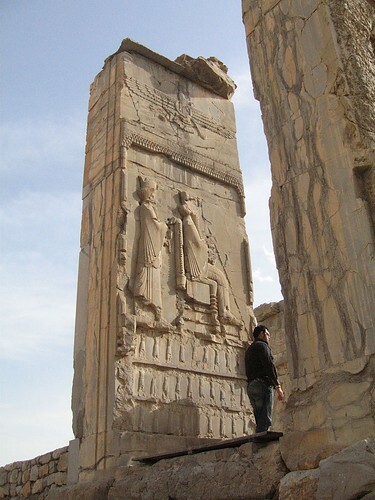 We lingered in Persepolis until the rose pink evening light gave out and then drove on to Shiraz. 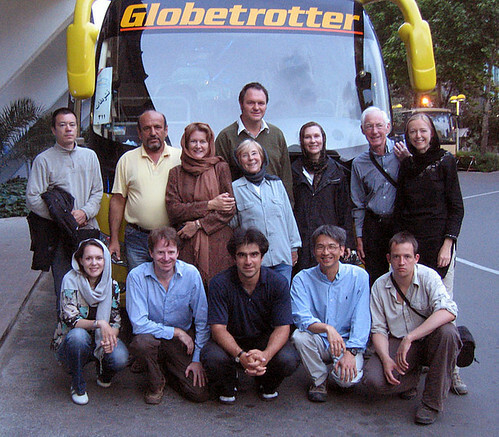 After checking in at the Eram hotel, Stan and Mehran took us for a stroll to the Arg-e Karim Khani Citadel (ارگ کریم خان‎‎) and back. As we walked back from the Citadel along Shiraz’s main street, a lovely lady rushed up and presented me with a Crown Imperial flower, then disappeared without a word but with a beautiful, bashful smile. If you want an example of how welcoming the Iranian people are, there you have it. The morning started in Vakil Bazaar (بازارِ وَکیل), where the courtyard of the old caravanserai provided a calm centre and one of the kiosks a new white top of suitable length for me. Then on to visit the Shiraz Botanical Gardens, home to the Eram Garden and Qavam House (Eram Palace) before returning to the bazaar to take a look inside the decorative brickwork walls and 14m high circular towers of the Arg-e Karim Khani (ارگ کریم خان‎‎), and its peaceful (now) central courtyard gardens. Tea and cake followed, Persian style, at the Saray-e Mehr Teahouse back in the bazaar after which DIY exploring took Margaret, Adrian and me first to the Vakil Mosque (مسجد وکیل Regent’s Mosque), where we found the central courtyard undergoing renovations but still beautiful tiled floral decorations on the doorways and simple carved columns spiralling up inside. Margaret and I borrowed floral bedsheet chadors – we weren’t very good at wearing them (well, we were diligent, just not very able), which amused a young chap visiting the mosque at the same time who asked to take our photo. So Margaret and I asked him to take one with our cameras too. In the backstreets of the bazaar we chanced across Jameh-e Atigh Mosque and at a bakery near the mausoleum of Shah-e Cheragh (شاه چراغ‎‎) the bakers gave us a “loaf” of lavash fresh from the oven. Delicious. You never tire of the aroma of fresh baked bread. Afternoon ended and evening began with poetry – first at the Tomb of Sa’di, then the Mausoleum of Hafez, where Mehran read us one of Hafez’s poems; in the moonlight it was lovely. Saying a fond farewell to Shiraz we set out for the day’s drive north, taking the mountain roads via Nurabad. We had the ruins at Bishapur (بیشاپور‎‎) to ourselves. Wild flowers sprouting between the ancient stonework of this city, founded by Sassanian King Shapur I (شاپور) in 266CE. 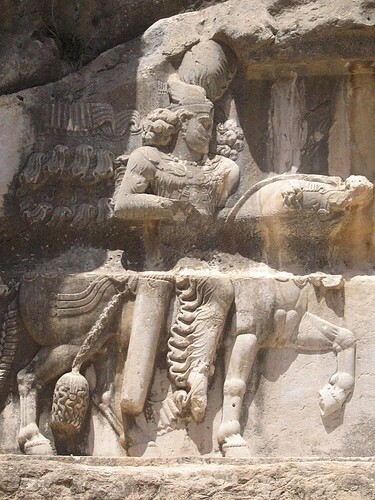 On the other side of the (modern) road from his ancient city, Shapur I commemorated his triple triumph over Rome with bas reliefs carved into the rock faces of the Bishapur River gorge. Leaving the Sassanids behind we continued our drive, winding up into the Zagros Mountains on a switchback roads to Yasuj, our day’s destination. Not particularly beautiful, Yasuj is a ski resort/university town high up in the Zagros Mountains. Having checked in at the hilltop Azadi Hotel we went for a stroll down to the gardens by the river and watched people fishing and picnicking. The road isn’t made for pedestrians, but we got lots of hellos from drivers and passengers. Our day finished with ice cream sundaes at the Azadi Hotel. Our drive from Yasuj to Isfahan via Semiron took us along river valleys and over hills with views of the snow capped Zagros Mountains and Mount Dena – we stopped for a late breakfast of tea, water melon, bread and cheese to take in the scenery. But the highlight of our day on the road was that we coincided with a group of Qashqai nomads on their annual migration to the summer pastures in the Zagros Mountains, women in traditional brightly coloured clothes riding mules and carrying the weaker lambs, nomad shepherds with their flock of goats and fat-bottomed sheep taking over the whole road. Arriving in Isfahan we stopped at Monar Jonban, the tomb of Abu Abdollah, with its two shaking minarets – as demonstrated by our own strongman, Reza – and then at a Zoroastrian fire temple, the Atashgah of Isfahan (آتشگاه اصفهان‎‎) with views down to the remnants of the Zayandeh Rud, riverside gardens and pigeon towers. 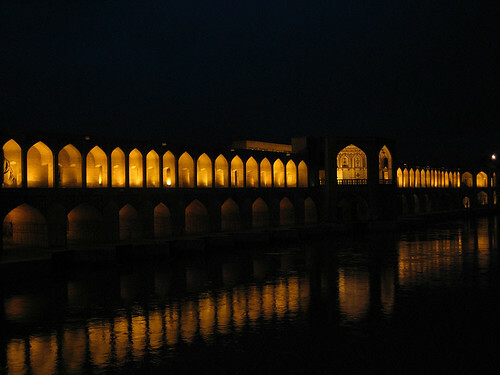 And finally, Khaju Bridge (پل خواجو)‎ as night fell. Our accommodation in Isfahan was the wonderful Abbasi Hotel – the caravanserai turned into a courtyard of bedrooms around gorgeous gardens, overlooked by the dome and minarets of the Madraseh-ye Chahar Bagh (مدرسه چهار باغ) next door. Our morning started with a tour of the beautiful Jameh Mosque (مسجد جامع اصفهان‎‎), then wandering back through the Bazar-e Bozorg to Naqsh-e Jahan Square where the entrance to the bazaar forms the north end of the vast Square, lined with arcaded shops, palaces and mosques and with fountains and gardens in the centre. Beautiful. 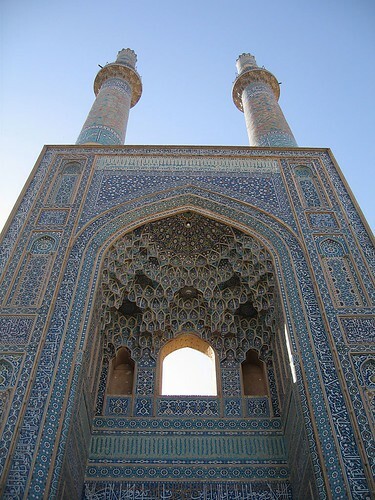 Our first port of call was at the far end of the Square – the mighty Imam Mosque (مسجد امام) / Shah Mosque (مسجد شاه). Next, the smaller, exquisite, Sheikh Lotfollah Mosque (مسجد شیخ لطف الله‎‎), then across the Square to the Ali Qapu Palace (عالی‌ قاپو) and beautiful views over the Square. We lunched at a traditional restaurant on the square and had the rest of the afternoon free to explore for ourselves. After pottering around the Square again and its adjacent side streets, I walked to the Si o Seh Pol Bridge (سی و سه پل) and along the Zayandeh river to the Khaju Bridge (پل خواجو)‎ and back, watching people enjoying the pedalos and fountains rise and fall as dusk fell. Dinner at the Restaurant Shahrzad. 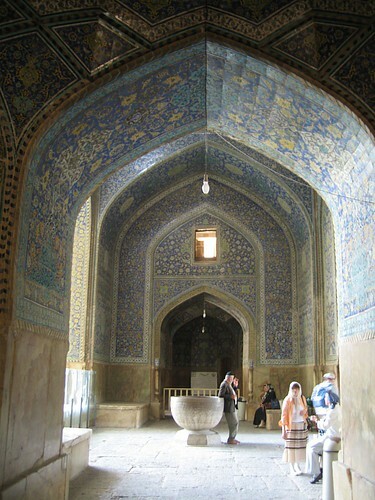 Saying farewell to wonderful Isfahan, we drove north to Tehran, stopping for a picnic lunch in Natanz (نطنز) at the simple shrine of sufi Abd al-Samad – beautiful mosaic and tile calligraphy, dating from the start of the 14th century. In a courtyard on the other side of the square from the shrine we found a set of palanquins used in a religious ceremony marking the death of the Fourth Imam (I think). Each one was smaller than the last. Back on the motorway, the afternoon views included the nuclear plant, a large salt lake (Daryacheh-ye Howz-e Soltan) and Shia scholarship-central, Qom. We hit Tehran at end-of-the-working-week rush hour, which made for a slow two hour crawl back to the Laleh hotel – but the fabulous dinner at the Khayyam Traditional Restaurant made up for everything. A long day’s drive to Bandar-e Anzali, under grey skies. The morning saw us crossing the green (and Wales-like) Alborz Mountains, pockets of snow proving no deterrent to the campers who’d come to the mountains to pick and feast on a pale green vegetable that looked like a cross between asparagus and rhubarb. A popular weekend activity. 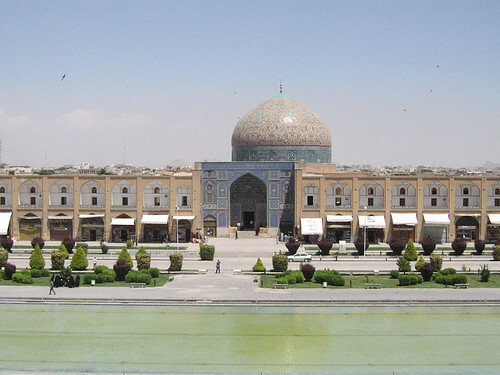 Two stops en route: the Shahbanu Farah reservoir, where the overflow proved mesmerizing, and the Dome of Soltaniyeh, mausoleum of Il-khan Öljeitü, which was in the middle of renovations. We had our picnic lunch in the gardens next to the Dome – another popular place for picnicking, and a young couple brought over some large bowls of stew to share with us. No strong memories of arriving in Bandar-e-Anzali nor of our 4* Hotel Sefid Kenar. A gloomy morning, but we managed a stroll along the shores of the Caspian Sea and then rather more than our allotted 30 minutes in Bandar-e Anzali – there was just too much to take in amidst all the hustle and bustle of the food bazaar – before starting the drive back to Tehran with a final picnic lunch en route, feasting on fresh goodies bought in Bandar’s bazaar. Having settled back in at the Laleh hotel, after driving into Tehran past giant paintings of the Ayatollahs and memorials to soldiers killed in the Iran-Iraq War, we headed out and spent up our last rials in the cake and nut shop nearby. A final group photo, then time to say farewell to Mehran and Reza and to head to the airport for our BA flight back to London. 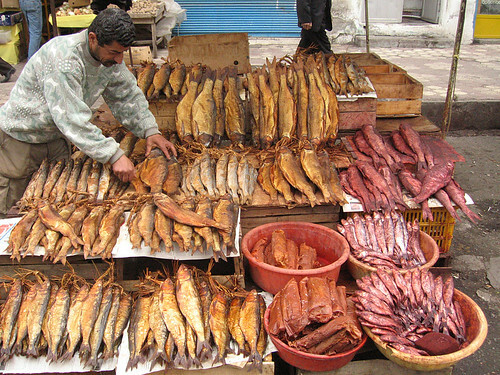 I’ve finally finished sorting through my photos from Iran, shrinking and uploading them to Flickr. 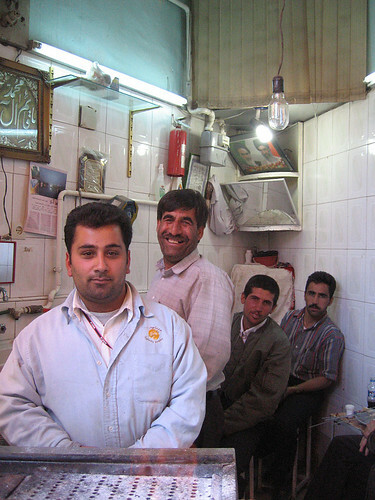 Mehran, Stan and Reza really were a winning team, and I would recommend a visit to Iran to anyone – it doesn’t really matter where or when, and different people will be interested in different things. Once you’ve been and seen what an an amazing and beautiful country it is, and that the people you meet in the bazaars and at the sights are so welcoming and hospitable, rightly proud of their history and culture, I am sure you will want to return – I know that I do. I’ve so many favourite memories – wandering the backstreets of Yazd, marvelling at everything in Esfahan, exploring the bazaars and mosques of Shiraz, hearing Persian poetry by moonlight at the mausoleum of Hafez, being presented by a beautiful flower by a young woman as we walked back to the hotel one evening, getting dressed up in traditional nomad wedding dress, carrying out conversations by way of the Lonely Planet Persian phrase book, being interviewed for local telly near Bazm and for an advertorial in the Abbasi Hotel, tucking into melon (various varieties), cheese and fresh bread with a breathtaking view of Mount Dena and minutes later chancing upon Qashqai nomads and their flocks on the annual migration to summer pastures – the young and the weak getting a ride tucked up snugly in carpets pockets on the back of a donkey, unexpected hail and film crews in ancient Hamadan, the Zoroastrian Towers of Silence (even when disrupted by the 21st century noise of young blokes on motorbikes), the kitsch souvenir shops, signage and stalagmites and stalactites at Ali Sadr Caves, staying in amazing converted/restored caravanserai in Yazd and Esfahan, relaxing in the Eram gardens, taking tea with the nomads near Bahvanat and trying my hand at churning butter in a goatskin, the smell of freshly baked bread and the production line four man bakeries in Kashan, Shiraz and Hamadan, the amazing switchback road climbing up and through the Alborz Mountains, through the green of the orchards and wheatfields, the grandeur of Persepolis and the peace and tranquility of the gardens of Fin, the stunning colours decorating the mosques and traditional houses, palaces and citadels – and flowers everywhere. Question: Where next Mary? Answer: Iran …..
On our first day, in Tehran, we were treated to an evening show of electric thunderstorms complete with amazing lightening, together with a fresh fall of snow on the Alborz mountains from the previous day, and were welcomed in Hamedan with hailstones the size of Mint Imperials bouncing off the main roads! Tuesday 03 April: Passport and visa arrived. I’ve been keeping an eye on the FCO travel advice, and as their Iran page says, “The overall level of the advice has not changed.” Long may it continue.